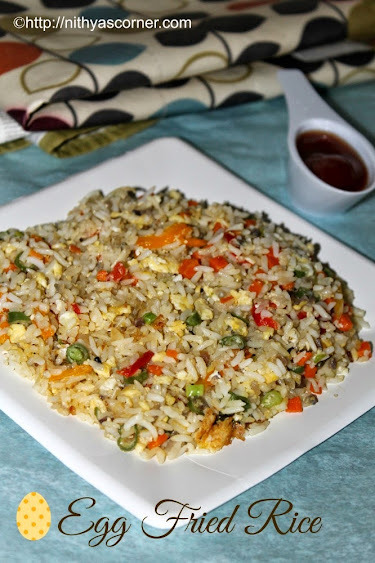 An egg-tremely fast and tempting friedrice! I had bough a large pack of soybean sprouts thinking that I’ll finish it off soon. Soybean sprouts get spoiled soon. With the big pack, I made subzis, curry, and sandwiches. 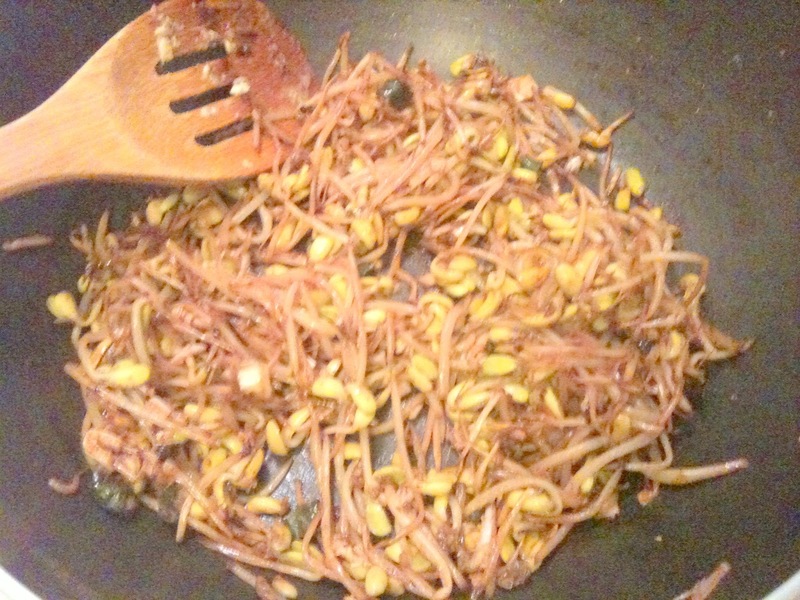 Then, when I looked for some rice varieties using sprouts, I found this tempting recipe in cookingandme website. Believe me or not, this dish came out very well. I just loved it. Finally, I found one of the ways I could eat this healthy sprouts.Thank you cookingandme for sharing this simple recipe. Green chillies – 2 To 3 nos. 1. Beat the eggs with some salt and pepper. 2. In a frying pan, heat two teaspoons of oil. Add the eggs and stir for some time. You will get egg scrambles. Leave it as large chunks and transfer it to a bowl. 3. In the same pan, add 2 teaspoons of oil. When the oil is hot, add the soybean sprouts and fry until the sprouts become little soft. Now, add the soya sauce, green chillies, and the ginger garlic paste. Saute until the raw smell of ginger garlic paste goes off. 4. Now, add the cooked rice, salt, and pepper. 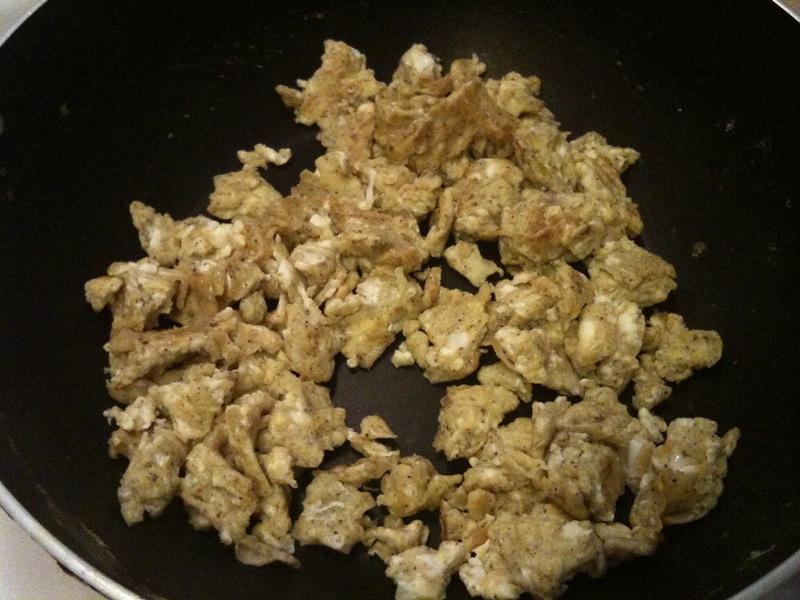 Finally, add the scrambled eggs and garnish using spring onions. Serve hot. Now, the Egg and Soyabean Sprouts Fried Rice is ready!!! 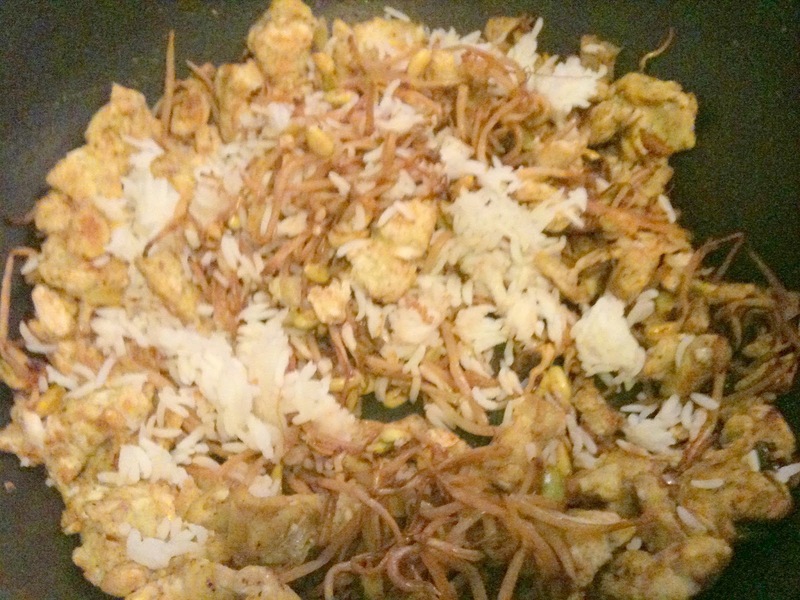 This entry was posted in Fried Rice and tagged boiled rice, Ginger garlic paste, rice varieties, sprouts on November 22, 2014 by vikashbhardwaz. During my childhood days, my brother used to get me Mushroom and Egg Fried Rice from a nearby restaurant on Friday nights. I used to crave for it. The mushroom fried rice would taste so heavenly. Even now when I think of it, my mouth starts watering….slurp..slurp. For some reason, the restaurant is closed now. Last time when I went to India for a vacation, the first thing I asked my brother is to buy me was the Mushroom Fried Rice. You could ask me why I have to depend on my brother to buy me this Fried Rice. My brother till date keeps it as a great secret, and never tells me the restaurant name from where he gets it. Till date, I am not able to break his secret. Probably after reading this post (if he reads), he should tell me. The Mushroom Fried Rice had always been a huge hit in my family. The restaurant chef used all the veggies that I have used in my recipe. However, I did not use the MSG salt (Monosodium Glutamate) as it is not good for health. You can use if you like it, but do not use it often. I hear often that this MSG salt (Monosodium Glutamate) produces hormone imbalance.Till date, I am missing that restaurant’s Mushroom Fried Rice. Usually, I love to have Fried Rice with Tomato Ketchup. Here, I do not get the same tomato ketchup that we get in India. Taste differs a lot. Whenever I make this recipe at home, I would give a big sigh and eat it with the Tomato Ketchup that is available here. This Mushroom Fried Rice recipe matches almost to that restaurant’s style Mushroom Fried Rice. I would always have mushrooms in my fridge. I make Mushroom Kuzhambu, Mushroom Omelette, and Mushroom Curry often. I make this Mushroom Fried Rice only when my taste buds demands Chicken or Gobi Manjurian. My hubby and Sanvi just loves it. You try it out and let me know how much you family appreciated you for making this recipe for them. 1. Soak Basmati rice in water for 10 to 15 minutes. Drain the water and cook the rice with 1 and 3/4 cup of water. The rice grains should be cooked and separated. 2. Fluff the rice off with a fork and spread it on a plate to cool down. In a non-stick pan, heat oil and add white part of spring onions and minced garlic. Stir well. Then add minced ginger. 3. Add finely chopped green chillies, shredded cabbage, and carrot. Saute well until cabbage shrinks and carrot is cooked 3/4th. Now add green part of the spring onions. Stir well. 4. Add mushroom and sauté until the mushroom becomes light brown and soft. Add capsicum and cook for 3 minutes. The capsicum should not become too soft. Then add soya sauce. 5. Quickly add chilli sauce and black pepper powder. Saute in high flame for 2 minutes. The vegetables should be blended well with the sauces. 6. Now add the cooked rice and salt. Stir gently so that the rice gets mixed up with the vegetables and sauces. Mix the rice well in such a way that the rice does not break. Garnish with the remaining green part of the spring onions. Now, Mushroom Fried Rice is ready! Serve hot with Gobi Manchurian, Chicken Manchurian or even Tomato Ketchup. Be careful while adding soya sauce as it may turn the fried rice salty and dark brown in color. Moreover the taste will also differ. While mixing rice with veggies and sauces, do it carefully otherwise rice may break. You can add ajinomoto, but I do not add it as it is not very good for health. If you are adding it, then add just before you add rice and sauté it for a minute or so. Do not overcook mushroom as it may turn soggy. Do not overcook the veggies. They should be little crispy. If you do not have time constraint, you can soak the rice in water for 30 minutes. 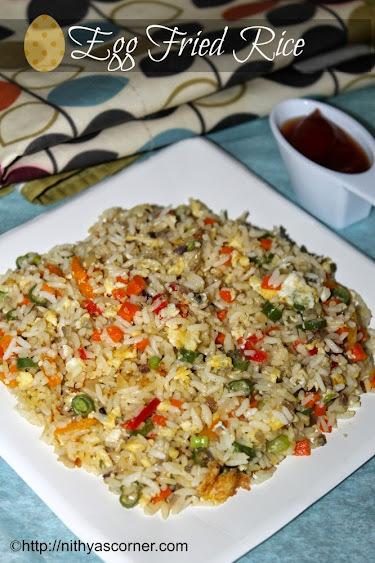 This entry was posted in Fried Rice and tagged Egg Fried Rice, Fried Rice, mushroom fried rice on November 22, 2014 by vikashbhardwaz. 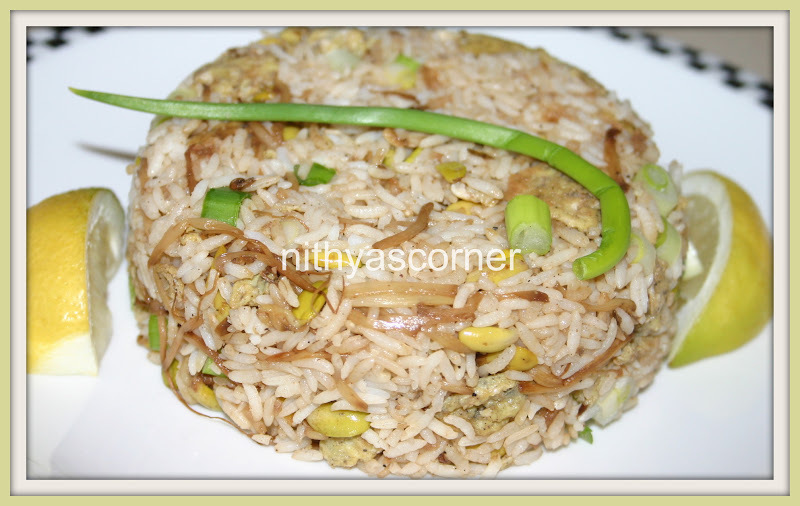 A Very Simple And Flavorful Pulao! Capsicum – 1 (Optional) I used red capsicum. 1. Wash and soak the basmati rice for 15 minutes. Drain and keep aside. 2. In a pan, heat oil. Add the cumin seeds and allow it to splutter. Add onions and fry until it becomes transparent. 3. Add the ginger garlic paste and saute till the raw smell goes off. Now, add the rice, bay leaf, coconut milk, water and required salt. Cook the rice. 4. In another pan, heat oil. Saute peas and asparagus for 5 minutes. 5. Now, add the peas and asparagus to the cooked rice and stir once. Garnish using coriander leaves. Now, the Asparagus and Peas Pulao is ready! Thank you Simple Indian Foods for sharing this recipe! This entry was posted in Pulao and tagged Asparagus, basmati rice, green peas, Peas Pulao on November 22, 2014 by vikashbhardwaz. 1. In a non-stick pan, heat oil. Let the mustard seeds splutter. Add curry leaves, urad dal and channa dal. When both the dals turn light brown, add the chopped onion and chopped green chillies. Fry until onions become transparent. 2. Now, add basil leaves and salt. Cook for 5 minutes. Add boiled rice and coriander leaves. Mix well. Cool the boiled rice down before adding it to the stove. Now, Basil rice (Thulasi Sadam) is ready! This entry was posted in Mixed Rice and tagged coriander leaves, Curry Leaves, Thulasi on November 22, 2014 by vikashbhardwaz. Chopped tomatoes – 4 nos. Red chillies – 6 to 8 nos. 1. Fry the ingredients listed under “Fry and Grind” with 1 teaspoon of oil. When ingredients turn light brown, switch off the stove. 2. Let the fried ingredients come to a room temperature then grind the ingredients coarsely without adding water. 3. In a cooker, add raw rice, toor dal, 6 cups of water, salt, and turmeric powder. Cook till the rice and dal are done. Amount of water to cook both the dal and rice depends on the quality of the rice and dal. Make sure you add atleast 6 cups of water (4 cups for rice and 2 cups for dal). 4. Heat oil in a wide bottomed pan. Add mustard seeds and let it splutter. Then add urad dal followed by onions. Fry onions till they turn transparent. 5. Add the vegetables and saute for few minutes until they become little tender. Once vegetables become little soft, add tomatoes and salt and fry for few minutes. 6. Add tamarind paste (2 cups) and boil for few minutes. Then, add curry leaves and the ground paste. Make sure you add tamarind paste only after the vegetables are cooked. 7. Add the boiled tamarind mixture to the dal and rice mixture present in the cooker. Mix well and then add 1 teaspoon Ghee to the Bisi Bele Bath and mix well once again. Now, Bisi Bele Bath is ready! This entry was posted in Mixed Rice and tagged Coriander seeds, cups, tamarind paste, Turmeric Powder on November 22, 2014 by vikashbhardwaz.